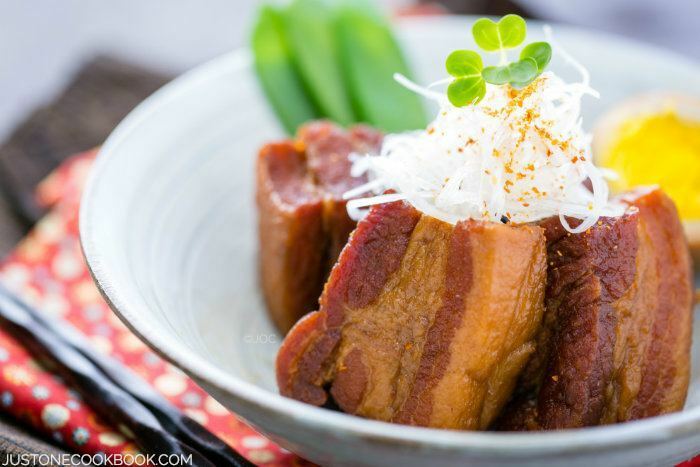 Kakuni (角煮) is Japanese braised pork belly, and it literary means “square simmered” referring to the shape of this dish. I’m not usually into fatty meat but there is something about this dish that I cannot resist. Slow cooking method turns the meat into a delicious creation. For my day-to-day cooking, I enjoy experimenting with existing recipes to see if I can improve them. I had been cooking this Kakuni recipe until one day my husband asked if the meat can be softer after I made it. I kept experimenting different methods and changing the ingredients’ portions, and I think I finally got the recipe that will melt in your mouth. The key for good Kakuni recipe is the initial simmering. For this recipe, I spent 2-3 hours of simmering the meat, but you could spend additional hours doing so if you have the time. This important process renders out the majority of fat from the pork belly and makes the meat and the fat have that melt-in-your-mouth texture. Although it takes hours of preparation (unless you have a pressure cooker), the result is really worth it. If you plan to cook this for your family, I would recommend you to make double portion. Since you have to spend hours in the kitchen anyway, you might want to make extra for a second meal. I hope you enjoy this recipe as much as my family does. 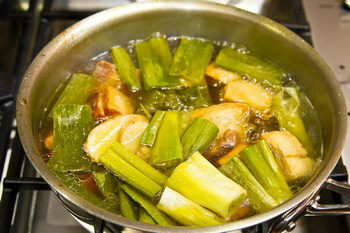 Kakuni (角煮) is Japanese braised pork belly, and it literary means "square simmered" referring to the shape of this dish. I'm not usually into fatty meat but there is something about this dish that I cannot resist. Slow cooking method turns the meat into a delicious creation. Pound the pork on both sides with a meat pounder (or edge of knife (not the sharp side)). Then mold the meat back into the original shape with your hands, and then cut into 2 inch pieces. Heat oil on the heavy skillet over medium high heat and put the fattiest part on the bottom. Cook the meat until all sides are nicely browned. To prevent from oil splatter, you can use a splatter screen. When the meat is nicely browned, transfer it to paper towel and wipe off excess fat. Slice the ginger and cut green part of Tokyo Negi into 2 inche pieces. 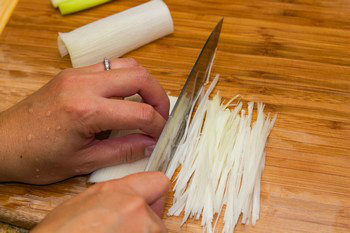 With the white part of Tokyo Negi, make Shiraga Negi for garnish (See How To Make Shiraga Negi). In a large pot, put the browned pork belly, green part of Tokyo Negi, half of sliced ginger (save some for later), and pour water to cover the meat. Bring it to a boil and then reduce heat to simmer. Cook uncovered (so unwanted smell goes away) for 2-3 hours, turning occasionally (if you want really tender meat, cook for at least 3 hours). When the liquid is running low, keep adding water (or hot water) to cover the meat. 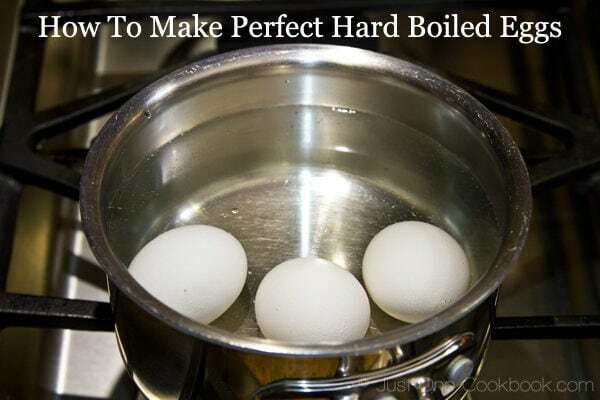 Meanwhile make 3 hard boiled eggs (Check How To Make Perfect Hard Boiled Eggs). 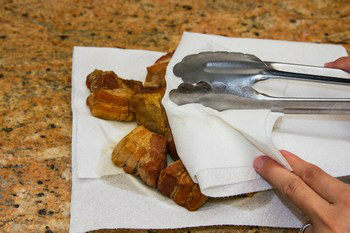 After cooking for 2 hours, drain and take out the meat and wipe off excess oil with paper towel. In another large pot (I use a cast iron pot), put the pork belly, dashi stock, sake, and mirin. Start cooking on medium high heat. Add sugar, soy sauce, the rest of ginger slices, and the red chili pepper (I remove the seeds for my kids.). When boiling, lower the heat but keep simmering. Place Otoshibuta on top (If you don't have an Otoshibuta, make one! 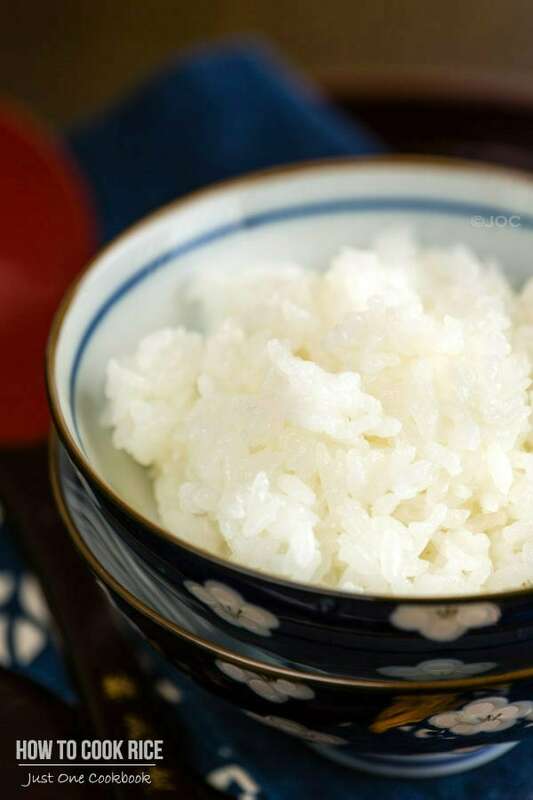 See How To Make Otoshibuta). We’ll be cooking for 1 hour. After cooking for 30 minutes, add the hard boiled eggs. Remove otoshibuta and continue simmering. Simmer for another 30 minutes. Once in a while pour the sauce on top of the meat and rotate the meat and eggs. Make sure you have enough liquid so they won’t get burnt. When the sauce gets reduced and the meat has nice glaze, it’s ready to serve. 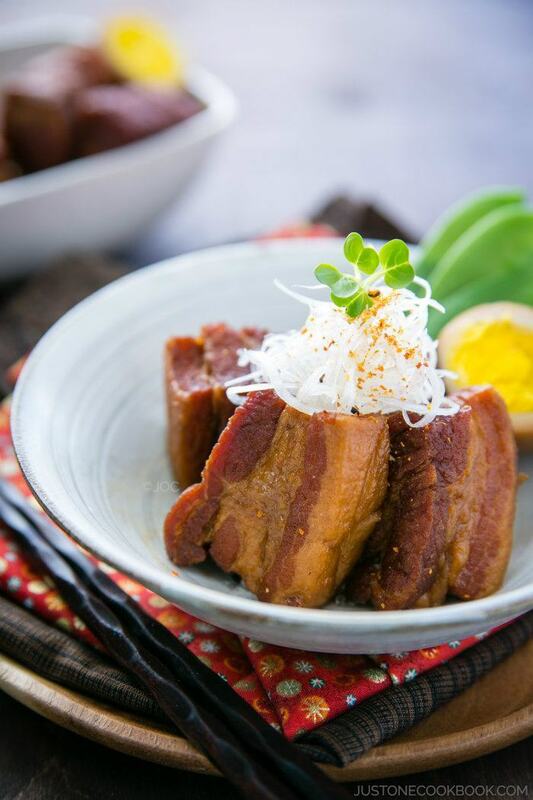 Serve the pork belly and eggs with Shiraga Negi on top. If you prefer this dish to be less oily and have more flavor, wait for another day. Cool down the pot completely and store it in the refrigerator overnight. Next day take out the pot from the refrigerator and remove the solidified fat before heating up. 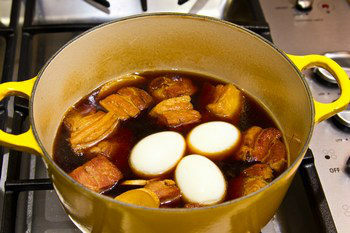 Heat thoroughly and serve the pork belly and eggs with Shiraga Negi on top. Pork Belly is the one more fatty meat I can eat. I cannot eat anything else fatty but this one is a treat for some reason. I think the time invested in this great recipe is totally worth it. I grow up on pure pork belly, and my grandpa even served it for breakfast which my kids would find it now not as appealing. My mouth started watering as soon as I saw your final plating. Very delicious!!!! Oh how I love braised pork belly! I’ve never tried to make it before but order it all the time. love buta kakuni & the okinawan version (rafute)! In spite of the hours spent simmering the pork belly and rendering the fat, I suspect there’s still a lot left. 🙂 The dish looks wonderful though. OMG This would be such an amazing dish to have for dinner! Succulent pork belly MEAT! I am so jealous of your husband and children as they get to eat all your yummy dishes! SIGHHHHH i’m not sure that I will have the skill or patience to make this but put it on my list and maybe one day! Very nice, we would really enjoy this. It looks well worth the time. OH. MY. GOODNESS. This is amazing. Anything with pork belly will surely make my family excited at the dinner table. The first part of your cooking, I thought I was seeing our own Filipino Lechon, crisp pork belly. But then I see you made a nice broth for it to go into. I must make your recipe – will bookmark this. I think 1 lb. is not enough for my hungry family — might make it 2-3 lbs. Thanks for sharing, Nami. I’ll let you know how my dish turns out. Pork belly dish always interest me because pork belly is one of my favourite ….. I don’t mind how long this pork belly gonna cook in long hours because I know this is superb tasty and delicious!!! And yes worthy to give this a try. As if I didn’t love pork belly (and YOU) enough already, you’re telling me eating it will make me more beautiful!? Um, pass the pork, please!!! 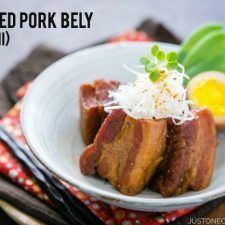 Nami, this is one of my favorite way to eat pork belly…I can have lot of rice bowls with it…yum! Hi Win! Thank YOU for following my blog. 🙂 I hope you enjoy this recipe! Hi Nami, I love kakuni as a topping with my ramen. If I see it on the menu, I will order it. I think this dish is quite similar to the braised pork belly with soy sauce that the Chinese do. We also simmer it for 2-3 hours to get the soft melt-in-yr-mouth texture. It is fun taking older recipes and improving upon them. It’s our mama’s food, but not the dish our mama made. 🙂 I tried braised pork belly a couple of month’s ago and found it too fatty; however, it didn’t look like yours at all. Yours looks like the fat has been rendered perfectly! I could definitely enjoy this dish! Soft, tender pork belly – you are speaking my language! We dont eat pork but this does sounds yum!!! I am loving the pics! I don’t eat pork but love beef belly. Do you think this can be cooked with beef belly? Omg, this looks soo good. It looks and reminds me of a Vietnamese dish my mom and grandmother makes. Looks delicious! I make a Chinese version of this dish from time to time, especially in the winter. 😉 It’s really good and warm up your whole body. And I’ve tried the Japanese version at a restaurant a while ago. It was just as delicious, if not better. I think most of the ingredients are the same. Except the Chinese one use ShaoXing cooking wine (plus rock sugar) and the Japanese one use mirin. 🙂 I really love this dish. I love your food styling too. It’s not easy to make a brown piece of meat looks wonderful in pictures and you did it! Mmm slow cooked meat is the best!!! Shimmering is a very good way to make any meat tender! I do that with veal which is quite tough! This is a very tasty dish Nami! I make a dish very similar and my family and friends love it. I love braised pork belly! I usually cook it using the Chinese red-cooking method, but this look tastier and a bit lighter. Good stuff – thanks. Oh, marvelous! I love pork belly and that dish looks ever so good. Hi Nami, long time no talk! Looks like you had a great trip at Taiwan, lots of yummies. I am making a much much more simplified braised pork recipe right now, in fact the slow cooker is doing all the work, I am sure your pork belly dish has a much better flavor depth though! Are you getting ready for the holidays? Our house is officially done, I signed off on the repair works yesterday, Jon’s been obsessed with cleaning the floor since the dark laminate got put in. He mentioned how much pet hair there is, I told him sorry we are not getting rid of the pets due to the mess they make. Haha! I am taking it easy with work during the Month of December, still designing here and there, though mostly just reading, learning, and gearing up for the new year. Though I do wonder what’s going to happen on December 21 (Mayan Calendar), maybe all these prep is unnecessary if the calendar is correct. Hope not! I have been enjoying the newly renovated kitchen, though still not posting on my blog. Facebook makes it so convenient to share photos, so my lazy bone is winning the battle, and I just can’t get into the swing of writing blog postings. Maybe I will pick it back up in 2013. I love the simplicity and purity of ingredients in this recipe and what amazes me most I think about Japanese cuisine generally, is that despite this simplicity, there is enormous flavour through the use of key ingredients… a pretty wonderful return. Your step by step illustrations are so helpful Nami. Great recipe. Gorgeous presentation. You make even brown food look good. How do you do that! As a loooover of bacon, I can’t see how this couldn’t be even MORE amazing. Lovely, Nami!! Even if I like healthy food, I cannot resist pork belly! This looks delicious Nami! I had a pork belly ones at Morimoto restaurant in Philadelphia, it was divine, very soft. You have the most interesting recipes here. I would love to learn to cook Japanese food, maybe one day when I visit you and we can cook together! How very flavorful this looks! I am pork belly obsessed, so this is right up my alley. Looking forward to a quiet winter weekend when I can give this a try. YUM! I can only drool over your photos lol! I am lost here, too many steps! Oh, this tender pork sounds fantastic, Nami! Can I come for dinner???? Sorry for my late response. My dashi pack is 9 gram per packet and I use 3 cups of water. Your package might have instruction written in the back (but could be in Japanese? ), but you probably need 1 1/2 cup. I wished you put that in your recipe above. I used a whole cup of dashi (dry) … of course after diluting it down after cooking, everything was extremely bitter. After all that long time cooking… anyhow, diluted it down, and it just wasn’t the same. too much water offset everything else. Maybe I will try again at another time, but after all these hours, I am deeply disappointed. I’m sure it was a good recipe. Just please be more specific on what type of dashi you used (liquid/powder, and if powder to mix with water… 2 1/2 cups of dashi was pretty specific). After I put all the ingredients in the pot, I said, wait this is not going to go well, needs water…. because too much dashi!!! Oh well. Strike one off my drawing board. Hi Adam! I did not use dashi powder for this recipe (as you see in my ingredient pictures – it’s dashi (liquid). 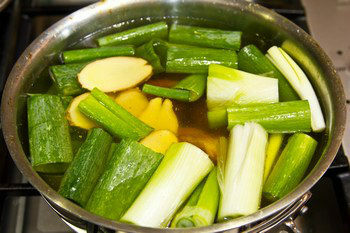 As stated in the recipe ingredients, I use 2 ½ cup dashi. Dashi can be made three ways: dashi powder, dashi packet, and making from scratch. Whatever your method is, dashi should be 2 ½ cup. Rena asked me that her dashi powder packet is 4 grams, and wanted to know the water amount for 4 grams. So I said 1 1/2 cup. To make this recipe, she will need more than 1 dashi powder packet. A lot of Japanese recipes require dashi. Depends on accessibility and time, you can choose powder, packet, or make from scratch to make dashi. Hope that makes sense. 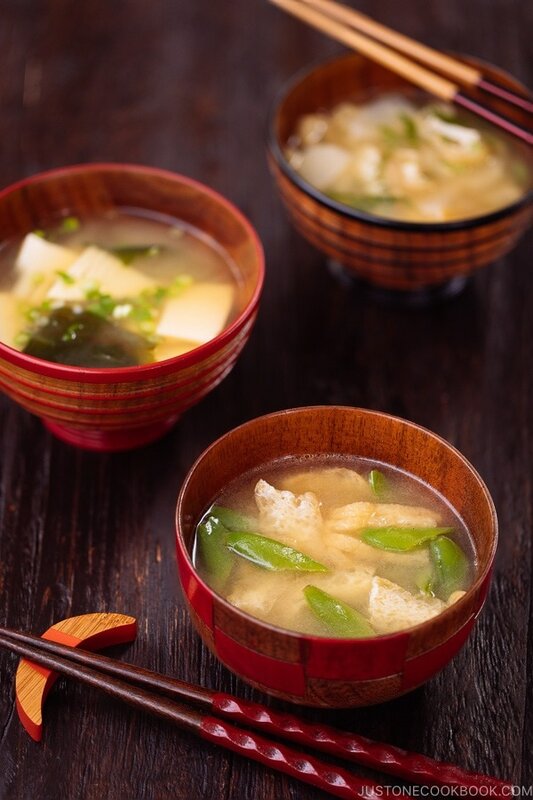 Did you use 2 ½ cup dashi POWDER? That’s crazy amount of dashi… I mean dashi powder doesn’t come with that much in a bag, right? What a great recipe, really useful pictures too. I don’t cook enough pork belly so I need to remember this one! Yummy! We sometimes enjoy this in our family, as our cozy lazy dinner menu. 🙂 Pretty much just place everything in the slow cooker and let the magic happens. I definitely love your version by having sake and mirin. Yum! I didn’t realize that pork belly is essentially bacon, haha. Oh goodness do I love bacon… this would be heaven. Nami, I will make sure to order some pork belly to try this dish. I absolutely adore these flavours and to hear that it is good for the skin? Even better! Nami, I also love pork belly… Smoked or not, I love it as much as ribs. I have never tried slowly braising it, however. It sounds very intriguing and tempting! And if it’s served with eggs, then it is definitely my kind of meal. oh gosh, braised pork belly is absolutely wonderful and yours looks and sounds divine! I am into fatty meat, I am telling ya, esp. pork belly. What is braised pork belly without the fats? Thanks for sharing the step-by-step instructions including the photos. 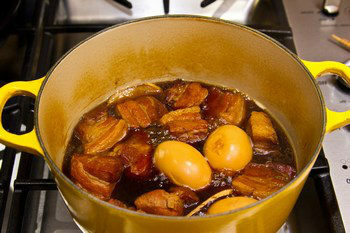 The Chinese also braise pork belly, and often five-spice is being used in the braising liquid. 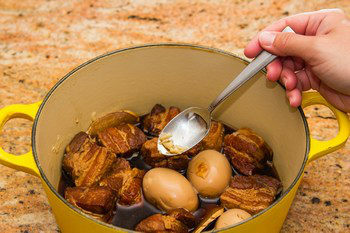 This is very similar like Chinese braised pork that we usually like to cook, next time I must try this recipe as my family love braised meat and eggs. We know fat is not good, but is soooooooooo good, it makes the meat to have more flavor. I LOVE buta no kakuni! And I’m always looking for a good recipe! Definitely a must-try…I can’t wait to try this, Nami! I can eat pork belly all day long…if only they’re not so fatty…I guess moderation is key. But my oh my, I can eat LOTS of this. I have a hard time controlling my appetite when faced with a delicious kakuni dish like this! Will actually try this this weekend! I need to buy one of those otoshibuta! I don’t know why we don’t use this more! It really helps the meat to become more tender. Looks really yummy! 🙂 Oh Nami, you make something I would never even attepmt to cook look so simple! This looks absolutely amazing. I recently bought some pork belly for the first time and have been trying to figure out what to do with it. This may just be it! I had no idea about the skin benefits of pork belly, I just know I love it. This looks fabulous. I know I will love this as I tried making some before. Yours look even better! Nami, what an intriguing recipe – you really explained all the steps so well, there is nothing that can go wrong when trying this recipe – it is rather easy to find porc belly around here (we are a nation of devoted porc eaters after all) and this would just be perfect for a meal during the holidays when we spent some time at home and lots of it in the kitchen. Very lovely! Um yum! 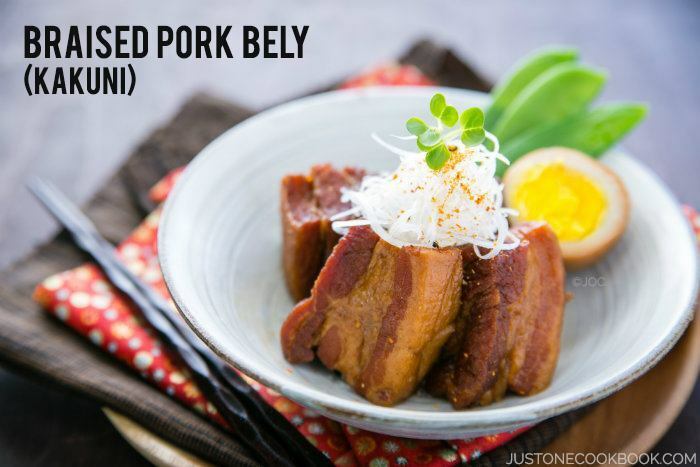 I love pork belly but my husband is very picky about his pork belly – I think he’d go crazy for this! I just had to order this when I was in Vegas this past weekend. It’s one of my favorite cuts of pork! How good do we have it? We get to come in and use your recipes that you have tweaked to perfection! It looks amazing Nami! Thanks! Isn’t braised pork belly one of the wonders of the food world?! Looks absolutely delicious and I recently discovered that awesome combination of braised pork belly with a green apple slaw that is so delicious and dangerous coz I am still trying to resist not cooking it too often. Thank you SO much for letting me know. I emailed the site and ask them to remove my content and pictures (I found at least 3 of my posts were stolen by this site). It’s such a shame for a pretty well-known website to steal someone’s contents which have copyright. If they won’t remove my site, I’ll report to Google and other search engines. Thank you very much for noticing and letting me know. Hi Nami! I tried this recipe for dinner tonight. It tasted so Japanese! I couldn’t believe it. My husband liked it too. I love Japanese food, and I can hardly find a restaurant in Singapore serving authentic Japanese food. Tonight I cooked one. Thanks a lot! I’ve been familiarized with Japanese taste when I was still working in a manufacturing plant in the Phils. (a Japanese company’s subsidiary). Japanese bosses and friends would bring me to restaurants serving authentic Japanese foods both in the Philippines and in Japan (when we have business trips). Oh, we have a common friend, Yukako. In fact, I learned about your website through her FB acct. So grateful to her for introducing your website to me. Yukako just sent me an e-mail telling me about her vacation. I miss her a lot. Call me Baby (I know it’s strange, but it’s part of my first name). Doctor is my husband’s surname. Haha! I tried your other recipes before but I didn’t get the authentic Japanese taste. Well, it’s because I didn’t follow the recipe (I substituted some ingredients). This is your first recipe that I followed 100%. I learned my lesson. I’ll let you know when I try your other recipes again. Hi Baby (that’s right, Yukako call you “Baby”)! She’s my best friend from college here. 🙂 Thanks for your kind words and hope you enjoy other recipes as well! 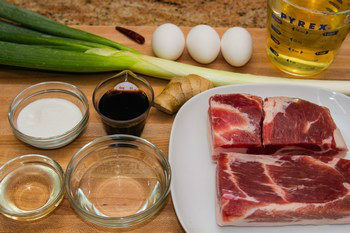 I bought pork belly today and look forward to making this recipe. Have you ever tried to do the braising in a slow cooker? I’m tempted as I would like to cook this on a weeknight but don’t want to sacrifice taste. Thanks! Last night was the first time I have ever cooked Japanese following your instructions for Yaki Udon. This is a simple and easy to follow recipe and most of all it was so scrumptious (my youngest son went for second! He is extremely fussy!) and I could easily take this to work instead of buying takeaway! Tonight I made Pork Belly. Boy, that was a long process! I had to take a 20 minutes nap during the simmering stage! In between the simmering I also made desert which all came together at the same time. I have one issue. I did double this recipe as I have too many mouths to feed and I knew they would go for second. My concern is with the simmering stage I did not lose any liquid nor did I lose any at the time where you put the rest of the ingredients, therefore, the meat did not get the glazed. Are we suppose to put less liquid in when we are doubling and also less sugar? (it was quite sweet) All in all the Pork Belly was devine! It still melted in your mouth and the fat you cannot even taste, it just blended with the flesh, for the sweetness, I made a side plate of mixed steamed vegetables as well as rice. Thank you for sharing this and the many more recipes I have listed to try out on weekends. Happy Girls Day! Thanks! I’m so glad you made this recipe. Can’t wait to try it at home. This looks like a labour of love and I can understand why, my mouth is watering!! I am obsessed with all of your recipes! This one in particular! The Okinawan Restaurant the boyfriend and I go to has a Shoyu Ramen that tastes just like this, the only thing is that they sear the pork belly at the end as well! I made this following the recipe but multiplied ingredients by four and used the liquid as broth for my Ramen. I only used a couple of pieces of pork belly for my ramen but I stored the rest for the next day to serve like in this recipe! The boyfriend compared it to our favorite Okinawan Restaurant and said it might even be better! Thanks! If you are ever in Orange County, CA then the name of the place is Habuya Okinawan Dining! It is a gem of a place! Thank you Nami for sharing this dish. I have made it 3 times and it is always a huge hit. I plan on making a book of all of my favourite recipes as gifts to my family and it goes without saying this will be in it. It was my number 1 dish of 2013!! Thank you so much! I was Thinking about Trying Your same Method on how you cook the Pork Belly But Use an Slow Cooker and cook the Pork Belly??? I have a pressure cooker…. I can use it between the steps 7~10? Hi Kassie! I suggest to make double portion (especially a family of four like us) but the recipe wasn’t double portion. I’ve been making double portion for my own use, but that can be a lot of meat for a couple or single person. 😀 Hope that helps! Your recipes has been my The-Go-To when it comes to Japanese food. 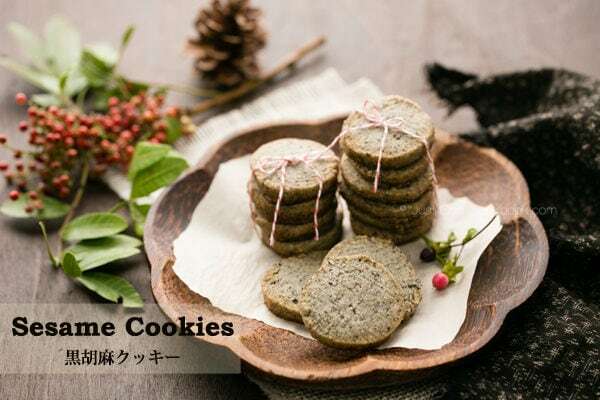 This Kakuni recipe is especially delicious. The pork belly turned out SO soft and tender it just melts in your mouth. It is the right amount of flavoring and even better the next day. I doubled the portion when I made this for my family and they loved it! My total cook time was 4.5 hours, simmering in low heat as instructed. I left the skin on and it didn’t turn out rubbery. Thank you so much for sharing you wonderful recipes! Hi Alina! I am not sure, but I feel that initial 10 minutes of cooking boiled eggs is the actual cooking. We didn’t boiled eggs for 40 minutes total. We added the boiled eggs (finished product) into the kakuni and cook. Did yours get green color? Hi Alina! Sorry my English is not good enough to explain this… but what I meant is that when you put the eggs into the Le Creuset pot, the egg is already a perfect hard boiled egg (without green layer). Therefore, even after I put the boiled eggs in the pot and cook for 30 minutes, eggs are not affected? Because boiled eggs required 12 mins of cooking, and it’s done. You let them cool and the process is completed. So whether you add to the another dish or not, it doesn’t “cook further”. I hope I’m making sense?! Ah I think I should just try to do i myself…:) I just fail to see how “the egg is not affected” if you cook it for another 30 minutes… It means it is cooked for 30 minutes more than a hard boiled egg needs to be cooked. Ohh that is actually a fun experiment. If you have a result, let me know! Hi Alina! Thank you so much for experimenting! 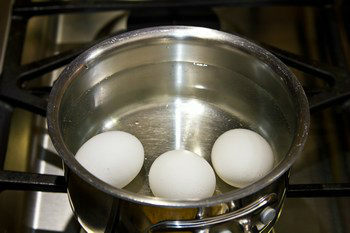 I always use cooked (and cooled) eggs when I need to cook the eggs in a pot. I always cook for 12 minutes (unless soft boiled eggs) and cool in ice water then peel before adding in the sauce and I don’t notice the green layer. It’s interesting that you brought up the topic that I never paid attention before! I’m glad you found out the way to keep the boiled egg less blue-green. 🙂 Thank you for sharing your experiment with us! I have a question though – If i have twice the amount of meat (2 lbs) that i want to use, does that mean i should double all the other ingredients too? I read your other recipe for kakuni cooked in a pressure cooker. My question is, why can’t I use this recipe and just cook the first simmer in a pressure cooker and use the same measurements for the sauce. I’m wondering why you had to change the amounts of the ingredients. Thank you! Thanks for this recipe. I love buta no kakuni. Once, I used it as a filling for kuapao–steamed buns with pork and garnished with pickled mustard and roughly ground peanuts. Today, I’ve just finished cooking chicken feet using the recipe. Can I call it “tori no ashi no kakuni”? Yummy! Hi John! 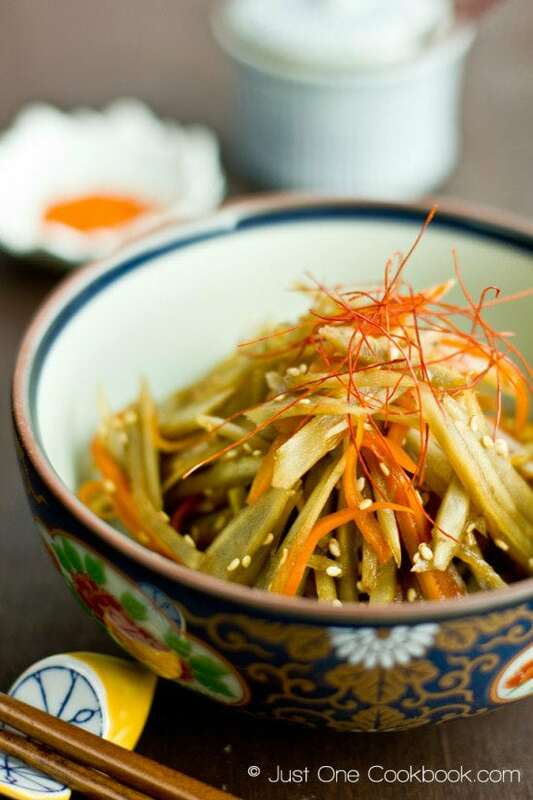 Ohhh i love to eat these with steamed buns! Hahaha the chicken feet name is funny. Kaku means square tho. 🙂 Thank you for your kind feedback! Thanks for the recipe! Do you think it would freeze well? Thank you for all of your recipes. I was wondering if you made a large batch is it ok to freeze & reheat later?? Made this tonight and it was a hit! Namie, you are truly a savior. The meat was very soft but next time, I will definitely make this the night before, refrigerate it and serve the next day (as you suggested). The sauce will definitely seep more flavor into the meat this way, and I also imagine the meat to be even more melt-in-your-mouth. On a sidenote, I didn’t find this to be oily in any way. Totally weird question but I plan on making this tomorrow night for my fam-jam. I was wondering what the green onion actually does for the dish? Negi itself doesn’t really have any flavours right? Is it really necessary to cook it with the pork for 3 hours? Thanks! Hi Kassie! 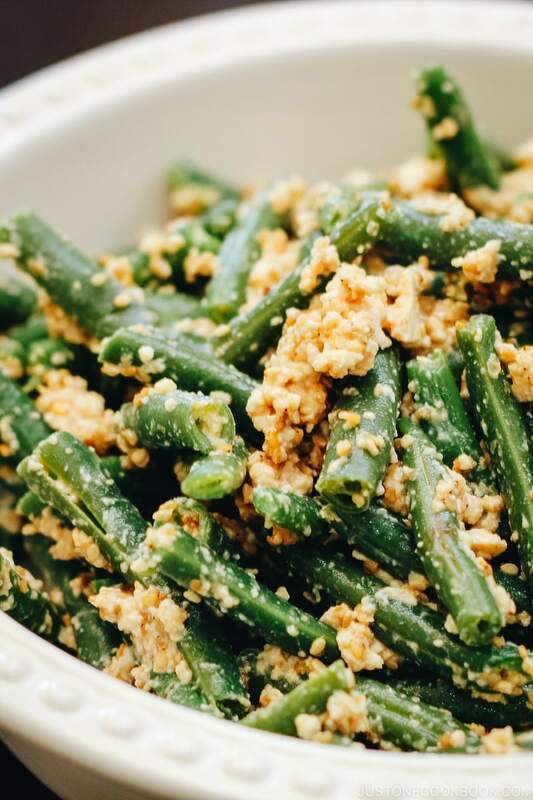 Ginger and green onions are used to remove the unwanted smell, and they are necessary for this process. It’s important, so don’t skip it. 🙂 Hope your family will enjoy this dish! Hi Nami, Hope all is well. I wanted to try this recipe this week. It looks delicious! Quick question: I currently does not own a Splatter Screen. I saw that you used it and also noticed that you listed the Progressive International Stainless Steel Splatter Screen on the shop page. How do you like it? Wondering if you have seen any other similar product that you would recommend? Thanks for your recommendations as always! Hi J! Thank you for asking, I’m doing good in Japan. 🙂 I love splatter screen! It is a fine mesh, so the steam can go away while regular lid will keep moisture inside the lid. Thank you, Nami! How do you clean the screen splatter? Is it easy to hand wash and get off the grease? does the handle transmit heat while cooking? Thanks! I usually throw into the dish washer (bottom, tallest side as diameter is pretty big). Grease will go away but it’s easily brown. I don’t scrub it as I use it often. The handle part – no, I don’t have any problem lifting it while cooking so I don’t think heat transmit that much. Also one side of splatter has a stand attach, so the splatter screen won’t touch the counter if you put it at the counter. Hi Nami, as mentioned, I am going to try this recipes this week. Just curious, Is step 2 you listed above very important? “Pound the pork on both sides with a meat pounder”, how would this step help the overall cooking process? Thanks! If I double the recipe by using 2 lbs of pork belly, , should I also double the dashi, ginger, scallions, sake, mirin, soy sauce? Also, during the simmering of pork in water, scallions, ginger, do you summer with or without a lid, and does it affect the outcome whether you use a lid or not? Hi Ren! Yes, I’d recommend to double the sauce so the meat is seasoned well. do you think i could make this in Instant Pot to save time? Would I just skip the boiling part and just went straight to the part where you cook the pork belly with sake, mirin and dashi? Hi Nami , hope you are well! May I ask if I use the pressure cooker how much time do I cook it for? I notice this pork you simmer it 2 times so how do I do it using pressure cooker? By the way, I have tried many of your recipes and they are fantastic! I just baked the strawberry shortcake for my hubby ‘s Birthday and it was fantastic ‘! Hi Nomi, it’s been awhile since this was posted, so I don’t know if you’ll get this comment. If you do, I was wondering if you have pressure cooker instructions for this recipe. I have an instant pot (thanks to you introducing it to us!) and would like to try it on this recipe. I attempted it with pork jowl as that’s how a restaurant that I regularly frequent does it and I was so impressed. I’ll use pork belly next time though. Hi Virginia! I am sorry for my late response. I’m really happy to hear yours came out well. How did the pork belly came out? It’s so cool you can get pork jowl – I used that for my pressure cooker recipe for the first time and I really like that piece (I could get it in a Korean meat shop). Thank you for trying my recipe! I’m glad you enjoy this recipe! The pork belly was an absolute hit! My partner is Japanese and he said he couldn’t tell that the Buta No Kakuni was made by a “gaijin”!!! I have you to thank! Hi Nami, can I do this with boneless pork ribs too? The only thing I regret after trying this recipe is not having followed the advice of doubling the amount…. I need more!! ???? Do you discard the pork broth after boiling the pork belly for 3 hours? Thank you! Hi Lu! Yes, in Japan, we typically throw away as we don’t really use pork broth in our cooking much. However, in Okinawa where food is quite different from the mainland, they use the pork broth for their famous Okinawa Soba. Basically you can use the cooking broth as long as you skim the foam and scum on the surface diligently. Hi Heidi! Oh my that sounds SO DELICIOUS! Thanks so much for trying this recipe and for your kind feedback! I have a question. Do you remove the skin off the belly before starting this process?